Android 5.0 is the latest version of Android is on its way to smartphones, tvs, wearables, cars and laptops. Google announced the Android 5.0 on google IO conference. Android 5.0 will feature lot of new features and updates. A comple redesign of the UI, called Material Design, A brand new runtime called ART, Project Volta the battery saver etc. This is the biggest revamp of total android from Android 4.0. The Android 5.0 is available for all the line of Nexus devices from 3rd November 2014. Nexus 6, Nexus 9 and Nexus Player are the first devices releasing with Android 5.0. Nexus line of devices from Nexus 4,5,7 are updated after the release. HTC and OnePlus have plans to go with Android 5.0 after 90 days of the source release. Complete List Here. Google also released Android Wear and Android Auto along with Android 5.0. Android is now entering into wearable like watches, wrist bands, glasses etc and Automobiles like in car infotainment systems. Android TV is getting whole new design change now. Also Google glass is getting hardware and software updates. 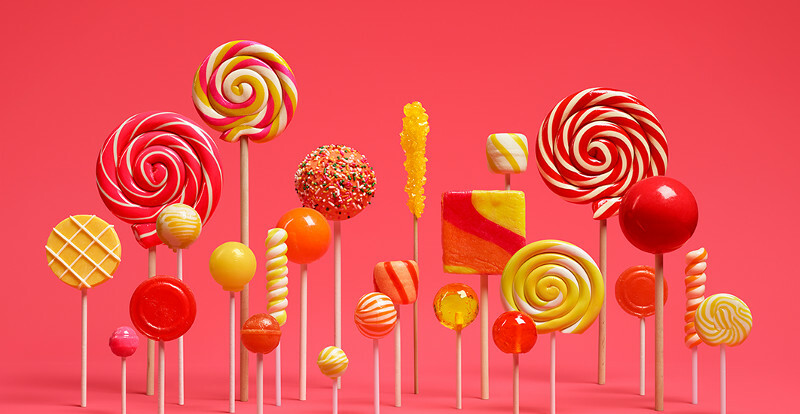 Have a look at what are the key features coming in Android 5.0 Lollipop. Google announced a whole new design guidelines and design language called Material Design. It is a complete UI overhaul with much more simple interface with 3D and textural shadows to the elements in the Android interface. It shows more realistic depth, lighting, shadowing and virtual textures that feels like real piece of cut-up paper. The new “Material Design” identity is bolder, more colourful, and more animated. Every transition between screens and every user interaction has been refined, down to the system-wide Roboto typeface and the Android navigation buttons. It provides much more consistent experience across Android device sizes and types. There’s more emphasis on simple shapes and consistent actions that lead you from one app into another. Google’s new design page offers clear guidelines about Material Design. The Material Design integrates its elements of responsive Web design and will extend the design spirit to other Google applications like Gmail, Youtube, Hangout etc. which will be redesigned for the Web as well as mobile apps. Material Design takes into account the fact that touch, voice, mouse and keyboard are all equally important input methods, clearly illustrating goals above and beyond smart-phone usage scenarios. Android 5.0 will receive a complete redesign of all the built-in apps according to the design guidelines provided by Material Design. 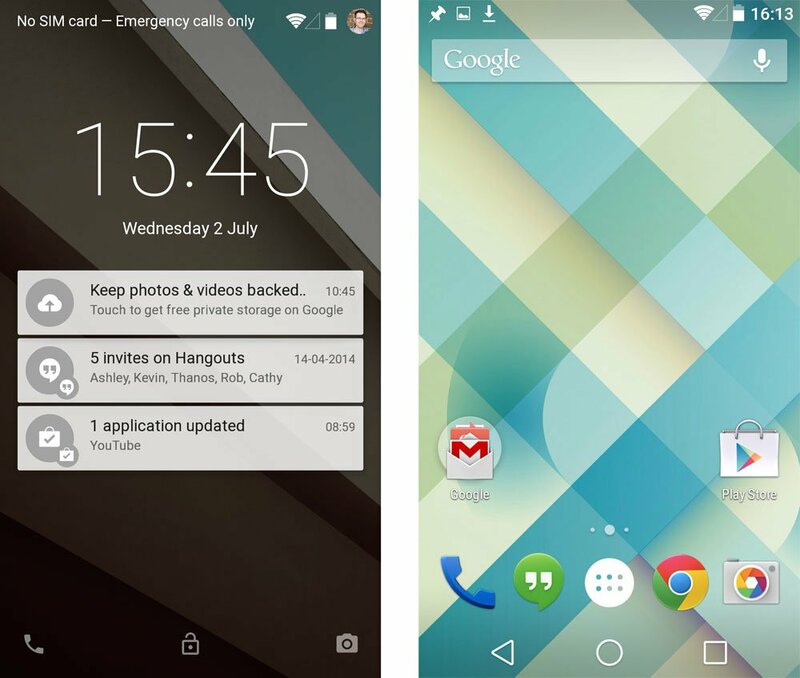 The soft Keys in android 5.0 is replaced with more simple icons. The back button is replaced by a triangle, the home button is replaced by a circle, the recent apps button is replaced with a square. The back arrow, pentagon, two squares are replaced by a triangle, circle, square. This is a clear indicator to the upcoming cleaner design of the apps and icons in android L. The triangle, circle and square are the basic elements in mathematics. 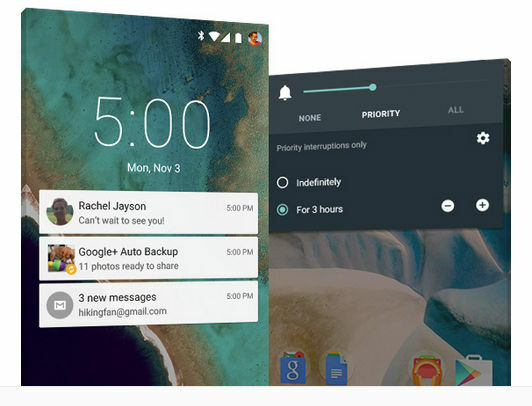 Android 5.0 will prioritize notifications based on which notifications are urgent and which ones are more important. It will never maintain a chronological order in Android 5,0. A new type of notification called heads up is present in Android 5.0. These kind of notifications are shown on top side of the screen irrespective of applications . Full Screen Notification and grabbing full attention of the user is gone now. Whether it is game or a map navigation if a heads up notification arises it will show on the top. A user can give an instant response to it. Notifications won’t clutter up your lock screen. Users can select whether snippets of actual messages are displayed when your phone is potentially visible to others, or whether more details will only be revealed when you unlock it. Android 5.0 can manage the battery of the phone more effectively. On android 5.0 a user can manage to get 90 minutes of extra uptime for the smart-phone. For calculating battery drain a new set tools have been developed that let developers track battery drain and optimise apps before they publish to google play. The battery saver mode is similar to those implemented by third parties so far – non-essential services can be turned off or made to run only at intervals in order to save power. Android 5.0 also managed to lower the screen refresh rate, reduce the frequency of data exchanges, or force apps to change their behaviour to match the prevailing battery state. Android 5.0 will detect the environment where the phone is. A lock screen code bypass can be possible if the phone can detect the presence of a Bluetooth device such as a smartwatch that wear all the time, or a specific Wi-Fi access point, or a particular location where a users home etc. When the environment is deemed safe, you won’t have to bother with unlocking your phone. Google is introducing a brand new runtime called ART. ART can make apps load and run quite a bit faster while using less RAM in the phone. ART is 64-bit compatible, and is also engineered to allow apps to work across hardware architectures such as ARM and X86. This also means that Android devices will be able to address more RAM than the 32-bit limit allowed. Android is now entering into more diversified hardwares so ART is optimized for different environments. Google has worked with major hardware vendors to enable more fluid graphics, potentially paving the way for new Android-based game consoles and set-top boxes. Desktop-class graphics including tessellation, geometry shaders and texture compression will potentially be possible on Android devices. ART is also more memory efficient, saving megabytes of RAM. Also 64-bit compatible for future hardwares. A preview of ART is already included in Android 4.4 KitKat. 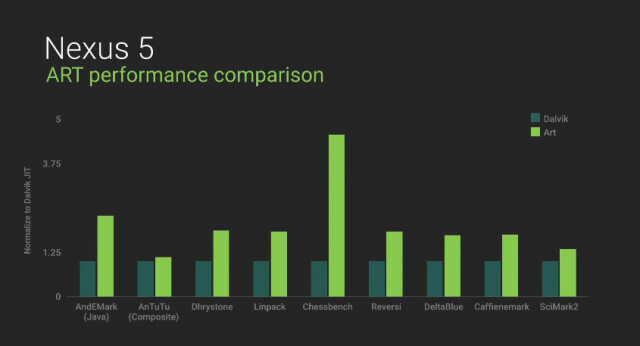 Performance graphs says ART is a way much better than Dalvik, the old runtime in android. Google is trying to syncing ChromeOS and Android much more deeper. Its first attempt to run some android apps in ChromeOS payed well. With Android 5.0 devices can connect to a Chromebook directly and automatically login into the system. Google also demonstrated Chrome OS notifications that can display SMS messages and call details on a Chromebook, also popping up warnings that your nearby phone is running low on battery. Google wants us to start treating Chromebooks like Android Wear devices. Google is heading up to merge these two platforms or creating a path to communicate each other with ease like automatically sync music, bookmarks, docs etc and control the phone from Chromebook. The new Google Fit framework will provide a complete platform for monitoring health activities by the smartphone. It allow tying into sensors on phones themselves as well as connected accessories to collect data which will be ready for apps to use. Major partners including Nike, Adidas, Runkeeper, HTC, Asus, LG and Motorola are already on board. Google Fit could monitor physical activity and food intake as well as health indicators such as heart rate and breathing. This is very meaningful in the current scenario that dedicated health band and other accessories are now trying to communicate with your smartphone. The android for work system allows users to have different set of profiles in Home, Work. So same apps can have multiple set of instance on same device with different data sets. It helps to seperate the work data from home data or personal data. Looks like different set of email accounts in same apps, different set of contact list in same phone etc. Samsung’s Knox feature for work and personal separation will become a part of Android itself. Knox allows corporate IT administrators to control work-related data and policies on employees’ smartphones while letting the employees themselves continue to store personal data and use unrelated apps. 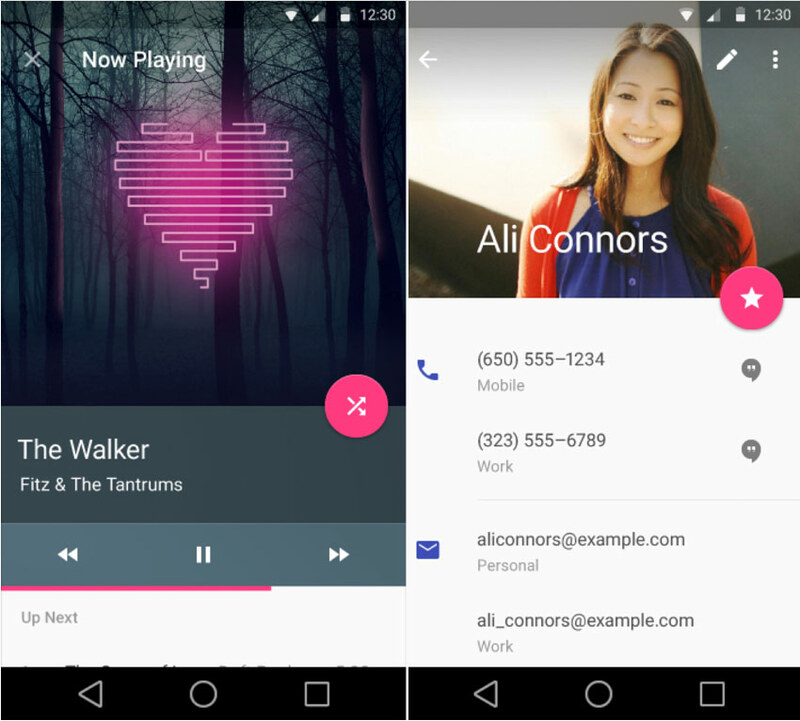 In Android 5.0 google is trying to communicate web apps and native system apps equally. 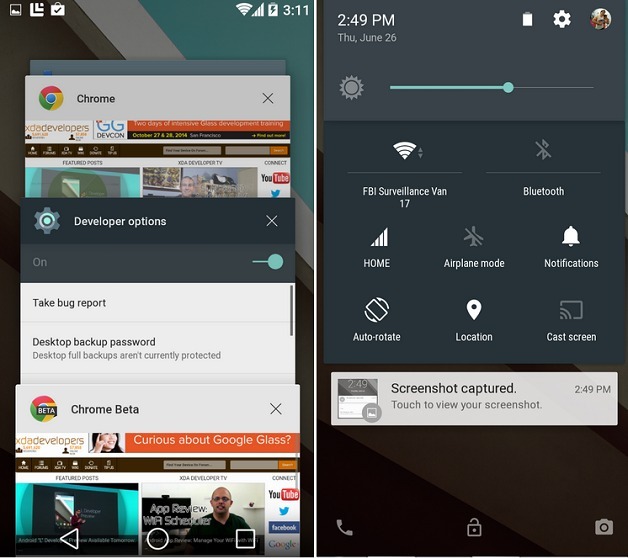 It made a change to the way individual web tabs and documents in apps are handled by Android 5.0. In the Recent menu the chrome tabs and recent apps get equal priority. Also material design plays a key role here that the user will not notice whether the tab is a web app or a native system app. This puts the user focus onto the things do with them. For example, Web apps open in Chrome tabs would appear much like native apps running on your device, and you’d be able to jump in and out of them more quickly. Links on the Web can now also be used to launch apps instead of websites (presumably falling back to the website in case the app is not installed). For example, Google demonstrated looking up a restaurant in Chrome and then tapping a link to not only launch the OpenTable app, but also have it know that it should bring up that restaurant’s booking page. Google search results can also now be links that trigger an app, rather than links to websites.